Writing with the flu does not for a good show review make. But I decided to fight the freezing temps and flurrying precipitation to catch night two of Tomorrow Never Knows at Lincoln Hall. In fact, it was quite the perfect background to walk into the venue midway through Lia Ices' fog-filled and blue-lit set. The crowd was particularly mellow this evening, which I certainly couldn’t complain about. Perhaps everyone was in same frame of mind as I was, or perhaps we were all just entranced by the beautiful music Lia and her backing band were making. The Cat Power-helmed-slowcore she creates is perfect music for a Chicago January evening. The combination of her minimal-orchestral pop and the handful of OTCs I had taken certainly helped alleviate my symptoms, if only for the brief set. If you missed her this weekend, she returns to the same venue opening for the Cave Singers April 7th. Isn’t that convenient? To kick things up a bit was former Vivian Girl/Crystal Stilt/Dum Dum Girl Frankie Rose with her backing Outs. The set was dynamically paced with a mix of shoegaze, garage-rock and a dash of psychobilly, all layered with enough reverb to fortify whatever wall of sound your construction needs require. Ms. Rose is at her best when on the bad-music-for-bad-people kick of "Must Be Nice" and "Don’t Tred." Monitor problems seemed to abound and there was never quite the right amount of vocals in the mix. The worst complaint was that the set was too short (which Frankie combatted via Twitter), but we’ve gotta keep in mind that their album is only half an hour long. 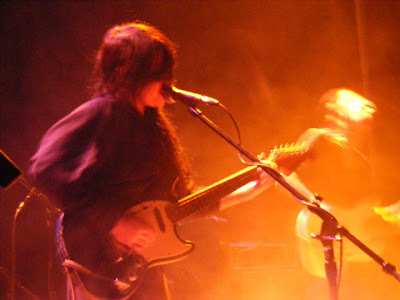 If you’re looking to catch more Rose related music, she used to drum for the Dum Dum Girls, who are hitting up the Empty Bottle February 24th. Personally, the abbreviated set worked better for me, as the aforementioned OTCs began to wear off. From the looks of it, I missed out on a fantastic set from the Besnard Lakes. Read up about it at Gaper’s Block and peak some photos up on Craig Shimala’s Flickr.